These Chocolate Caramels are proof that the best recipes don’t need to come from a fancy cookbook or famous chef. This recipe for Chocolate Caramels was included when I ordered candy wrappers. The ingredients are basic, and the instructions are simple, yet the caramels are utterly sublime. They taste a lot like See’s Candies chocolate lollipops but with a chewy caramel texture. I made a few slight modifications like adding a little bit of cinnamon and a finishing salt. Adding 1/4 teaspoon of cinnamon provides a hint of cinnamon without overpowering the chocolate. Makes a 9×9 inch pan of caramels. The number of caramels will depend on the size that you cut them. Butter a 9×9 inch pan or line it with parchment paper. I prefer using parchment paper as it makes it easy to remove the caramels from the pan. Mix the sugar, light corn syrup, cocoa, butter, and whipping cream in a heavy, large saucepan. Boil, stirring constantly until a candy thermometer reaches 248°F. If you want slightly softer caramels, cook the caramels to 246°F. Don’t boil the mixture too vigorously, otherwise the caramel will burn. Also stir the mixture constantly and don’t take your eye off of it to keep it from developing hot spots and burning. It will take a while (15 minutes or more) for the caramel to reach the right temperature so just keep stirring. Your patience will be rewarded. Take a caramel off the heat, and quickly, but carefully whisk in the vanilla and cinnamon (be careful as the vanilla may cause the caramel to bubble up a bit). Sprinkle sea salt on top of the caramels. When cool, cut into small squares with a buttered knife or pizza cutter and wrap in waxed caramel/taffy wrap or waxed paper. I really like the convenience and look of cellophane candy wrappers. 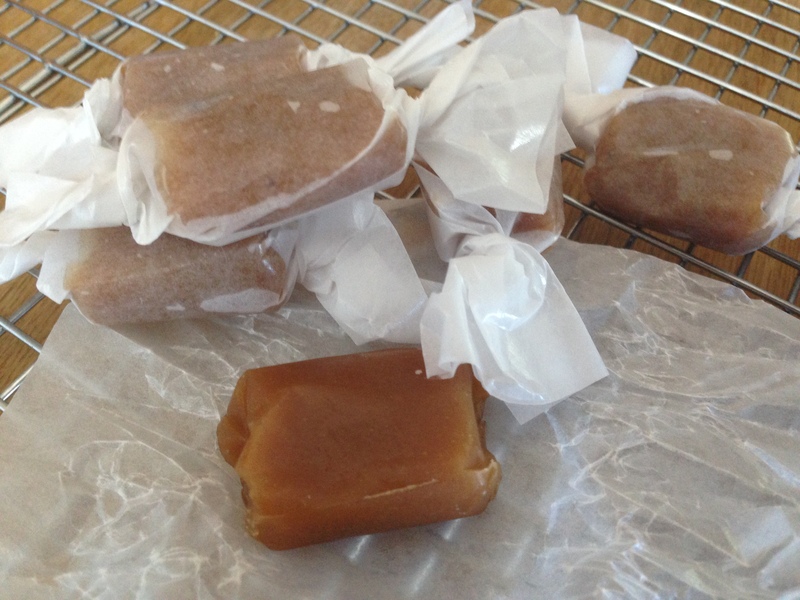 Note: The caramels will keep for two weeks in an airtight container at room temperature and longer if refrigerated. Bring them to room temperature before eating. Because it’s not slathered in chocolate or piled high with toppings, I always forget how utterly delicious and super addictive nut brittle is. This nut brittle recipe is proof that keeping it simple is super. I used whole hazelnuts and almonds, but you can use nearly any nut you like. One of my favorite things about this recipe is that although the brittle is hard, once you bite into it, it has an airiness and light crunch to it, and the richness of the nuts provides a good contrast to the sweet caramelized sugar. I’ve been told that this brittle was so delicious that people fought over the crumbs. Line a large sheet pan [I prefer an 11×17 inch pan so that the brittle isn’t too thick and difficult to bite into. The orginal recipe recommends a 10×15-inch sheet pan.] with parchment paper [making sure the parchment paper goes up the sides of the pan], or you can lightly oil it [I prefer using parchment because it makes for super easy clean up and it doesn’t add any extra flavors and grease like oil can]. Add the nuts, and cook while stirring to 320°F [make sure to stir often to ensure the nuts do not burn], or until the batch is light brown [My batch started to brown around 310°F, so make sure to keep an eye on it. Also, the brittle will darken up when you add the remaining ingredients, so it’s OK if it starts out very lightly browned.]. Remove the pan from heat, and quickly mix in the salt, butter, vanilla, and baking soda thoroughly. Be careful as the ingredients will bubble up as you add them. [Notes: The brittle can be stored in an airtight container at room temperature for several weeks. Take a chewy, rich butterscotch caramel, mix in some Rice Krispies cereal for a bit of crunch, slather on a thick, smooth, dark chocolate ganache, sprinkle a little sea salt on top, and voila, you’ve just been introduced to the perfect little candy, Chocolate Covered Crispy Butterscotch Caramels. The trickiest parts of this recipe are 1) making sure the caramel gets to the correct temperature (a bit of patience and vigilant attention are needed) and 2) waiting a few hours for the chocolate ganache to firm up so that you can cut the caramels into squares. So, if you have a bit of patience and a candy thermometer, get to it! You won’t be disappointed. The Maldon sea salt I used created little crater-like designs on the chocolate ganache. And the crater-like surface of the caramel is due to the rice krispies. Slide the pan from the heat and add the puffed rice, vanilla, and salt. Be careful—the mixture will bubble up, and the steam is super hot. Using a heatproof spatula, stir, without scraping the bottom and sides, until blended. Pour the crispy caramel, without scraping the bottom or sides of the saucepan, into the prepared baking pan. Set aside to cool until warm to the touch, about 45 minutes. Whisk until well blended and smooth. Pour the melted chocolate over the still-warm caramel. Using an offset spatula, spread the ganache evenly. Use the foil [or parchment] “handles” to lift the entire caramel from the pan. Carefully peel or tear away the foil [or parchment] and discard; set the caramel, chocolate side up, on a cutting board. Grease the blade of a long, sharp knife with butter or cooking spray and, using a ruler as a guide (or by eye), cut crosswise into 8 equal strips and then cut each strip into 6 pieces. Note: The caramels can be stored in an airtight container at room temperature for up to one month. Ahhh, mes amis, it has finally happened. I’ve been afflicted with a baking malaise where the thought of baking the usual cookie, cake, or brownie has become total ennui to me. So while I wait for baking inspiration to strike again, I am passing the time making things I typically deem to be too complicated to make from scratch. Thus, I present to you homemade Vanilla Marshmallows which are like soft, fluffy clouds. In the process of making them I’ve learned that 1) yes, it is possible to make marshmallows at home, 2) using gelatin does not require any fancy skills, and 3) marshmallows can have actual taste and flavor (other than sugar). Put 1/2 cup cold water, the granulated sugar, and corn syrup in a 2- to 3-quart saucepan. If using a vanilla bean, split it and scrape the seeds into the pan; add the pod, too. Stir with a heatproof spatula just to combine (try not to get any sugar on the sides of the pan), then bring to a boil over medium-high heat without stirring. Attach a candy thermometer to the side of the pan. With the mixer running, break the hydrated gelatin into several pieces and add it to the bowl one piece at a time, beating until incorporated. Increase the mixer speed to high and beat until the marshmallow is white, thick, and almost tripled in volume, about 6 minutes. If using vanilla extract or vanilla bean paste, add it now, beating until just combined. Sift about 1/4 cup of the sugar-cornstarch mixture evenly over the top. Let set at room temperature for at least 3 hours and preferably overnight. Note: Store the marshmallows in an airtight container at room temperature for up to 1 month.